Combustible Dust In Your Industry Can Kill! In any industrial facility, combustible dust is a very real danger. Evaluating the many hazards of combustible dust, educating employees and alleviating potential risks are all vital components to fostering a safe work environment. Also, in compliance with OSHA safety standards, every employer is responsible for recognizing potentially life-threatening hazards in the workplace and removing them. Numerous tragedies in the past stand as a testament to how dangerous combustible dust can be. 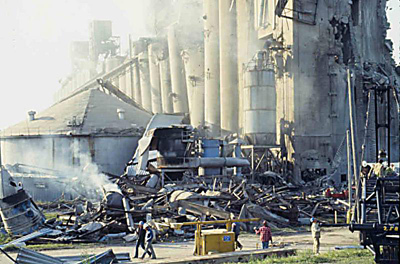 One of the first events to garner considerable attention in regards to combustible dust explosions was in the 1970's. During this time, a number of devastating combustible dust explosions broke out in grain elevators, claiming the lives of 59 people and injuring 59. Shortly after, OSHA released a "Grain Elevator Industry Hazard Alert" to alleviate future incidents through employee and managerial safety education. By 1987 OSHA's Grain Handling Facilities standard was put in place. In February of 1999, a foundry in Massachusetts was the site of a powerful explosion caused by phenol formaldehyde resin dust. The initial fire and explosion was responsible for dislodging additional combustible dust that had settled in the air ducts, allowing for another, more powerful explosion to take place which was so intense it lifted the roof from the building. In February of 2003, an oven fire broke out at an acoustics insulation manufacturing plant in Kentucky. Shortly after the fire broke out, a series of combustible gas explosions rocked the facility, killing 7 and injuring 37. Just one month earlier, in 2003, a similar tragic event occurred at a pharmaceutical plant in North Carolina when combustible polyurethane dust exploded. The dust had accumulated unnoticed in the ceiling until an unknown ignition source set off a chain reaction, severely damaging the facility and nearby buildings, including a school. 6 lives were lost that day and 38 individuals were injured. Investigations into incidents like these found that multiple inadequacies in workplace safety education, equipment maintenance and poor hazard assessment were to blame. 1. Fuel - Any form of combustible dust or flammable material. 2. Heat - A source of ignition that can come in contact with the dust. 3. 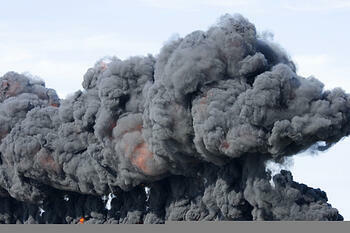 Oxygen - An oxidizing agent which can allow the fire to spread. Keeping these three factors in mind, a combustible dust explosion can occur when two additional conditions are met. First, the combustible dust particulates must be found in heavy concentrations. Secondly, the combustible dust must be at least partially confined to one area. These two extra prerequisites define the "Explosion Pentagon". Combustible dust will ignite and burn at an astonishing rate in confined or semi-confined areas due to the inability of the combustible dust to be diffused or diluted by proper ventilation. When this happens, the stage for a combustible dust explosion is set and the risks to employees greatly increases. 1. Materials which have been processed into much smaller particles. 2. Any activities that require the production and/or the consumption of combustible dust. 3. 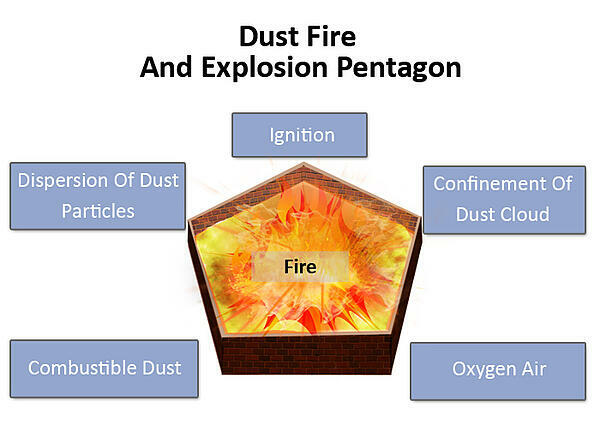 Areas in which combustible dust can accumulate for long periods of time. 4. The possibility for combustible dust to be released into the air. 5. A means for which combustible dust can find a source of ignition. The most innocent of dust particles can be a potential problem when conditions are right. Take a look at the video and see why. 1. Utilize dust filters to collect combustible particulates and catch dust which may escape from ventilation systems or industrial processing equipment. 2. Make cleaning a priority and provide employees with work surfaces that are resistant to dust accumulation. 3. Have a dust inspection performed on a regular basis, especially in otherwise restricted areas. 4. If cleaning up dust, only use vacuum cleaners that have been specifically designed for this purpose. 5. Create a consistent plan for combustible dust testing, removal and employee education on the matter. 1. Ensure all electrical equipment is properly installed and adheres to all wiring safety standards. 2. Minimize static electricity, sparks from machinery or friction. 3. Keep heated surfaces and systems dust-free. 4. Maintain, clean and use all equipment properly. 5. Utilize separator devices in order to remove unwanted combustible materials from production processes. In many cases, the ignition of combustible dust can be traced back to a piece of electrical equipment. Identifying and monitoring potential ignition sources is a crucial component to preventing disasters from ever occurring at your facility. Once a potential ignition source has been identified, it must be wired within Class II specifications to make the equipment "dust-tight" or "dust-ignition-proof". Employees and members of management are ultimately the biggest deterrent when it comes to preventing combustible dust incidents from occurring. Facilities which handle hazardous materials like combustible dust are required to properly label containers, maintain consistent safety data sheets and providing ongoing training to employees. The Hazard Communication standard helps ensure every individual is adequately trained to mitigate combustible dust fires or explosions along with any other potential hazards in the workplace. By carefully studying combustible dust safety standards and staying in compliance at all times, you can rest assured your employees can enjoy a safe, productive work environment. Do not let there be any shadow of a doubt that a combustible dust tragedy could happen at your workplace. With the right balance of safety education, preventative countermeasures and ongoing assessment, the dangers of combustible dust can be drastically reduced.